The global MPI is a new generation of multidimensional measures that supports key priorities in the Sustainable Development Goals (SDGs). High-resolution poverty diagnostics are needed to leave no one behind. The global MPI is disaggregated by children, disability status, sub-national regions and rural/urban areas. Linked indices of destitution and severe poverty highlight the very poorest. 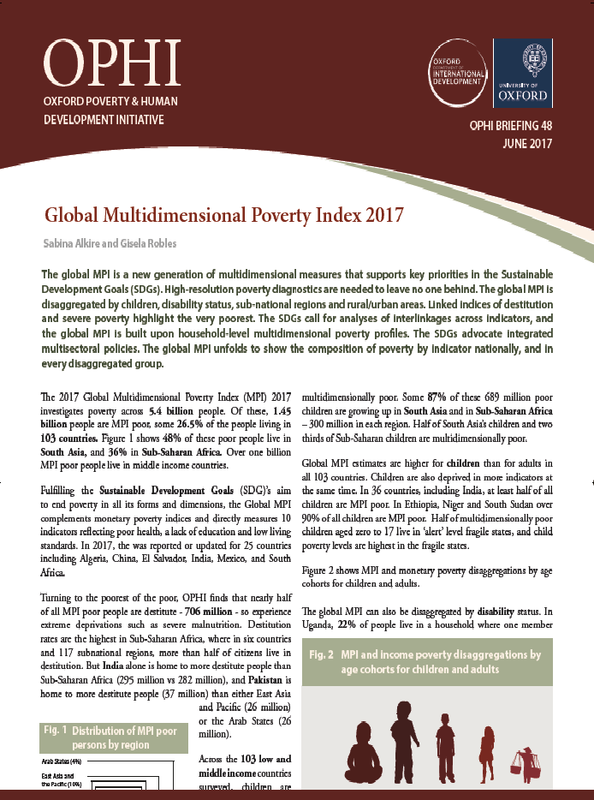 The SDGs call for analyses of interlinkages across indicators, and the global MPI is built upon household-level multidimensional poverty profiles. The SDGs advocate integrated multisectoral policies. The global MPI unfolds to show the composition of poverty by indicator nationally, and in every disaggregated group.